Errant bosses have been listing false addresses on a Ministry of Manpower (MOM) online database while housing their foreign workers in sub-standard conditions. They declare that the men are living in approved housing such as purpose-built dormitories, while actually putting them up in cheaper places such as shophouses, factory-converted dorms or construction site quarters. It comes down to money, said Ms Debbie Fordyce, a volunteer at welfare group Transient Workers Count Too. A place at a dorm, with amenities like mini-marts and basketball courts, costs about $300 a month. But housing workers at construction sites can be free, while a month's stay in a shophouse is about $200. Industry players who spoke to The Sunday Times said bosses are willing to be dishonest as they know it is difficult for MOM to check. Short of spot-checks at every dorm, it is hard to verify the addresses of all 771,100 work permit holders, excluding maids who live in their employers' homes. "How do you even start to check when there are so many places?" said Mr Jolovan Wham, executive director of the Humanitarian Organisation for Migration Economics. In recent years, he has seen several workers not living at their registered addresses. Industry players said bosses have managed to abuse the address registration process because of its ease of use. All they have to do on the Online Foreign Worker Address Service is to log in with their SingPass IDs and passwords, and then key in the addresses and postal codes of their workers' abodes. The information will be accepted as long as the dorm listed has not reached its maximum occupancy. One construction boss said the system is so easy to "cheat" that some employers get clerks to key in postal codes of various dorms in the hope of hitting one that is not fully occupied. "It's trial and error. The staff will keep trying until they find one which is not full," he said. As a result, dorms end up being full according to MOM's database. Bosses who want to legitimately house their workers there cannot register as the website says places are not available. "We have to wait a few days for the dorm operators to compare their records with MOM and remove the names of bogus workers," he said. There are no official figures on how many foreign workers have fake addresses. But it runs into the hundreds at least, based on estimates by employers and migrant worker activists. Industry players admit that this has been happening since the online database for addresses was launched about 10 years ago but did not raise the issue as Singapore has been grappling with a shortage of dorms in recent years. But with more dorms coming up, it is time to tackle the problem, they added. Last December, the Government announced that the inter-ministerial committee on foreign worker issues headed by Deputy Prime Minister Tharman Shanmugaratnam wants to speed up the building of more dorms. Bosses will be encouraged to house their workers in purpose-built dorms if more are readily available, said those in the sector. There are currently about 40 commercially run dorms, each housing a few thousand workers. That is enough space for 180,000 foreign workers - about 23 per cent of those here. Bosses suggest that MOM give deadlines to employers to move workers out of poor housing places to the new dorms when they are ready. Dorm operators can also help by tallying their records with MOM's. "They can find out who is providing false information once the names don't match," said one employer. Migrant worker activists said workers must also be encouraged to speak up about poor housing. But many are afraid because they do not want to lose their jobs. This is a sentiment shared by many workers interviewed by The Sunday Times. 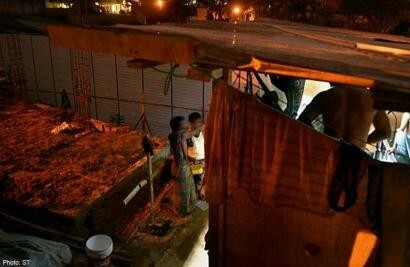 Bangladeshi worker Mohd Nasirruddin, who shares a zinc-roof hut with six others at a construction site, said: "It is hot at night. Sometimes I cannot sleep. But it's okay. I want to work and earn money."